Seeger popularized “This Land Is Your Land” and “We Shall Overcome” and wrote “If I Had a Hammer” and “Turn, Turn, Turn.” He opposed McCarthyism, marched beside MLK and led environmental campaigns. But whatever you called him, Seeger influenced scores of other singers, including Springsteen, Joan Baez, Dave Matthews, Rufus Wainwright, John Mellencamp andArlo Guthrie. All performed in 2009 at Seeger’s 90th birthday party at sold-outMadison Square Garden, a fundraiser for his favorite local cause: cleaning up New York’s Hudson River. On his facebook page Tuesday, Arlo Guthrie, who performed often with Seeger and is the son of Woody Guthrie (who taught Seeger how to jump freight trains), described his last phone call to Seeger’s hospital bed Monday night. “I simply wanted him to know that I loved him dearly, like a father in some ways, a mentor in others and just as a dear friend a lot of the time,” Guthrie wrote. “‘Arlo,’” Seeger said, “sounding just like the man I’ve known all of my life, ‘I guess I’ll see ya later.’ I’ve always loved the rising and falling inflections in his voice. Seeger opposed McCarthyism, marched beside the Rev. Dr. Martin Luther King Jr. and led environmental campaigns. In 1969, he helped build a 10-foot sailing sloop called the Clearwater that continues to serve as a “floating classroom” and rallying point for cleaning up the Hudson. In 2006, Springsteen helped introduce Seeger to a new generation when he recordedWe Shall Overcome: The Seeger Sessions, an album of 13 songs popularized by Seeger, including John Henry and Shenandoah. Three years later, Springsteen persuaded Seeger to sing This Land Is Your Land with him at President Obama’s inaugural concert in frigid temperatures on the steps of the Lincoln Memorial. Much earlier, poet Carl Sandberg crowned Seeger “America’s tuning fork.” But whenBob Dylan called Seeger a saint, that was going too far. 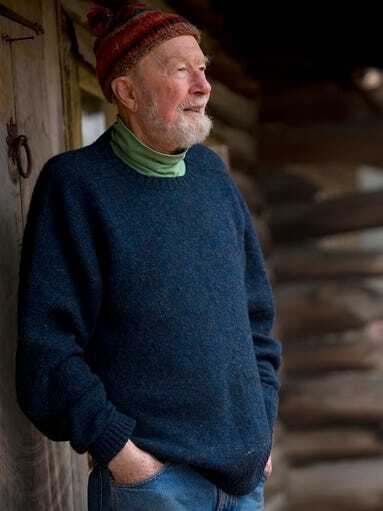 Folk singer and political and environmental activist Pete Seeger poses for a portrait at his home in his house in Dutchess Junction, N.Y., in November 2008.Seeger, who sang for migrant workers, college students and presidents in a career that introduced generations of Americans to their folk music heritage, died on Jan. 28 at the age of 94. For more than 60 years, he lived in Beacon, N.Y., with his wife, Toshi, in a cabin he mostly built himself on a cliff overlooking the Hudson River, 60 miles north ofManhattan. Toshi, whom he called “the brains of the family,” died at 91 in 2013, after nearly 70 years of marriage. Seeger is suvived by a son, Daniel; two daughters, Mika Seeger and Tinya Seeger; six grandchildren; and a great-grandson. If he didn’t being want to be called a folk singer, what term did he prefer? The last time I saw Seeger perform was in 2010 at an environmental fundraiser in an old church in Dobbs Ferry, N.Y. He looked as pleased to be singing with a local children’s chorus, with kids named Destiny Burroughs and Maddy Murphy, as he had at Madison Square Garden with Springsteen, Baez and Mellencamp.